Winter Skate at Patriot Place presented by Harvard Pilgrim Health Care will host its third annual Finale on Ice figure skating show on Sunday, March 1, at 3 p.m. Finale on Ice will mark the end of the 2014-2015 skating season at Winter Skate. Admission is a donation to the Hockomock Area YMCA’s Reach Out for Youth & Families Campaign or a new or gently used coat benefiting Cradles to Crayons. One admission grants access for up to four people. Maxim Naumov, 13, is an intermediate skater and a member of the Charter Oak Figure Skating Club. In 2013, he won the U.S. National Juvenile title and is currently the New England Regional Intermediate men’s champion. Naumov is training year-round at the International Skating Center of Connecticut and has dreams of becoming an Olympian. Taylor-Rae Rocco, a freshman at the University of Hartford, is the 2012 New England Regional Novice Ladies silver medalist, the 2015 New England Regional Junior Ladies silver medalist and a two-time Eastern Sectional competitor. Rocco is coached by two-time Olympians and world champion pair skaters, Vladim Naumov and Evgenia Shishkova, at the International Skating Center of Connecticut. 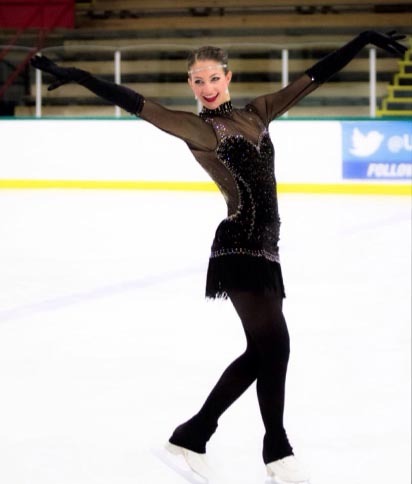 Jamiesen Cyr, a member of the Colonial Figure Skating Club in Boxborough, Mass., is the 2015 New England Regional Juvenile Girls silver medalist. At just 12 years old, Cyr recently represented New England at the 2015 Eastern Sectional Figure Skating Championships, and will be competing at the Intermediate level in the upcoming season. Cyr is coached by Matthew Lind, Sergey Minaev, Suna Murray, Ronna Gladstone and Curt Doten. Jade Esposito and Nathan Rensing, from the Colonial Figure Skating Club in Boxboro, Mass., are coached by former Olympians Sheryl Franks and Chad Brennan. The pair moved up a division this year and competed as intermediate pairs. In November 2014, Esposito, a seventh grader at Newton Country Day School from Weston, Mass. and Rensing, an 11th grader at Wachusett Regional High School from Sterling, Mass., won the bronze medal at the 2015 Eastern Sectional Championships. In January, the duo competed at the 2015 U.S. Figure Skating Championships in Greensboro, N.C., marking their third trip to the U.S. Championships. Ocean State Ice Theatre, founded in 2007 by Sarah Mirza DiNardo and the Pawtucket and Providence Figure Skating Club, is the first and only theatre on ice team in Rhode Island. Achievements over the past eight years have included winning four National Theatre on Ice Championships, earning the bronze medal at the 2011 Nation’s Cup competition, a world theatre on ice event. The team was recently featured by Cox Communications in a documentary entitled, “The Road to Nationals,” which detailed every step of their competitive season. Ocean State Ice Theatre Preliminary Team, from the Pawtucket and Providence Figure Skating Club, is comprised of nine skaters from Rhode Island and Massachusetts. The team recently debuted their Peter Pan program at the club’s holiday show and looks forward to performing at the Winter Skate Finale on Ice at Patriot Place. Wendy Sheridan, the national announcer for U.S. Figure Skating, will announce the show, which will be directed by Ashley Brouillette with music by Creative Music Productions. The event, sponsored by the Pawtucket and Providence Figure Skating Club, is sanctioned by U.S. Figure Skating. An autograph signing session with the skaters will take place following the show. Winter Skate is located at Patriot Place, adjacent to Route 1, near the Renaissance Boston Patriot Place Hotel. It is steps from Patriot Place’s north marketplace, which offers a wide variety of shopping and dining options, a 14-screen movie theater and one of a kind attractions like The Hall at Patriot Place presented by Raytheon. For more information, visit www.patriot-place.com/winterskate.